Beautifully updated villa with gorgeous lagoon views and just a 2-minute walk to the beach! 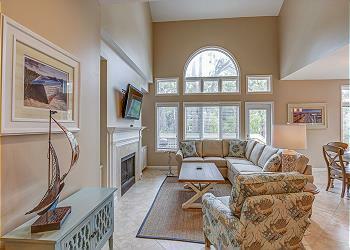 This 3 bedroom, 3.5 bath villa is in the heart of Palmetto Dunes. The kitchen has been updated to include granite countertops and stainless-steel appliances. The dining room has seating for 6 with additional seating for 4 at the kitchen bar. Off the dining room is access to the screened in porch which is the perfect place to relax. Off the porch is the sundeck where you can enjoy the lagoon views while sipping on your morning coffee. The master bedroom outfitted with a king bed and a flat panel TV is on the main level. The master bath has granite countertops, gorgeous Travertine tile floors, separate shower, and garden tub. There is also 1/2 bath on this level. The second floor hosts the other 2 bedrooms; one with 2 double beds and the other with a queen bed. Each bedroom has an updated private bathroom and a flat panel TV. The views from this beautiful Palmetto Dunes villa and its location will not disappoint.